Birth Day - These 2 words consist life. It is when you took your first breath, fist cry and fist view of this wonderful world. This one special day comes every year in everyone's life and fills us with joy, fun, enjoyment and lots of memories. 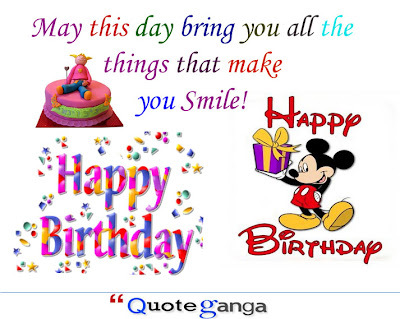 So in this post, we shall share the world's most amazing new Birthday Wishes to pass on your words for this most awaited day of anyone's life. When sad: Smile is made for you and do not let it be away from you. Today is the good day to have it a lot. When Alone: Loneliness is not for the cheer-able person like you, let have big party with all friends and family.. They are waiting for you, please! When away: Although you are away from us by distance but you live in our hearts. Between 0-6: You are growing and so our happiness are. Each day, you gave us the great moment. Keep growing and smiling. My dear kid, this birthday is like our day when God gave us the most wonderful gift of life. We are with you always. Between 7-15: You are getting more smarter, cute and mature. May God keep blessing you. Between: 16-20: Years have been passed like seconds and you are now bigger, smarter and tall. Angry: Although you are angry with me but this is for short time but our relation is forever. So how can I let this come in our relation. I am pleased to wish you happy and sweetest day ever. Late: Sorry, due to some unavoidable circumstances, I am late but no worries, my cares and love always remain close to you.